Nelsan Ellis has been the most amazing Lafayette that anyone could have asked for. His portrayal is nothing short of amazing and I’d have been happy to see a Lafayette spinoff, but we all know that Nelsan has more talent to share elsewhere and that his flamboyant Merlotte’s cook is just the tip of the talent he will show to future audiences in others parts. An example of such a portrayal is the upcoming role he will play of Bobby Byrd in the new film, Get On Up, the James Brown biopic, which will be out August 1. His Lafayette has been a jewel. I am in awe of his performance. I’m glad he’s getting a story of his own this season, and not just reacting to other people’s story arcs. It’s about time he got some lovin.’ He and Nathan have good chemistry. I could see and feel the connection between them. Looking forward to “Get On Up” and Nelsan’s dancing. I absolutely adore Lafayette and that is due to Nelsan’s stellar portrayal. Thrilled Lala is finding love again . Love when he dances,it makes me want to get up and dance with him. Love Nelsan. Love this interview. Can’t wait to see Get On Up. I think the guy who plays James now is better anyway. What a wonderful interview with Nelsan Ellis. Thanks for posting. 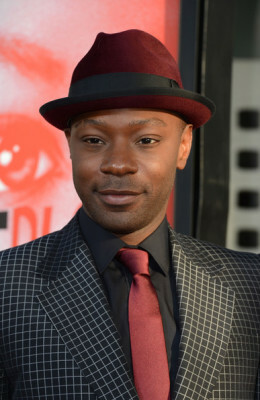 Great Article…Nelsan also played MLK in Lee Daniel’s ‘The Butler’ and he has a part in ‘The Help’. His character is who I will miss most. Such a talented actor, I just can’t get enough of Lafayette, love him!